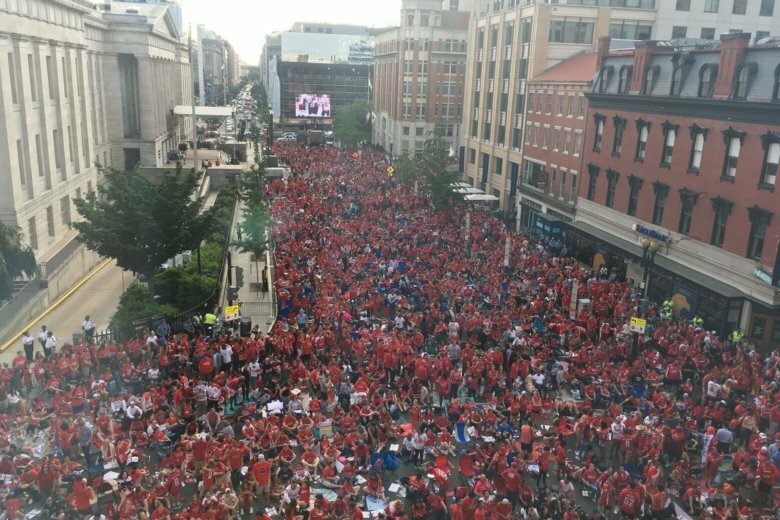 Caps fans started gathering at Capital One Arena on Thursday morning, hours before the puck dropped in Game 5 of the Stanley Cup Final. “It’s like Woodstock for the Capital fans,” one fan said. WASHINGTON — Josh Stendeback arrived at Capital One Arena at 8:50 a.m. Thursday. Fans went wild as the Washington Capitals made history and captured the Stanley Cup for the first time ever. See photos and hear how they reacted to the win. Donning a red, No. 92 Evgeny Kuznetsov sweater and a Washington Nationals cap, Stendeback was the first person in line for Thursday night’s Stanley Cup Final Game 5 Watch Party at Capital One Arena. A Virginia native, Stendeback and his brother Dan grew up playing street hockey and later roller hockey with neighborhood kids. The last time he remembered being this excited for a hockey game was the 1998 Stanley Cup Final when the Capitals were swept by the Detroit Red Wings, one of hockey’s all-time great squads. Mark Kelner found himself in the red abyss starting at 1 p.m. He posted-up on the National Portrait Gallery’s 7th St. steps — the holy shrine to Capitals victories this postseason. Accompanying Kelner, thanks to some creativity, a few plastic bowls, a roll of duct tape and a ton of tin foil, was his homemade version of Lord Stanley’s famed goblet. A lifelong Capitals fan, the Rockville native said his fiancé refuses to touch his replica of the NHL’s championship trophy out of fear of jinxing their beloved Capitals’ chances. “It’s like Woodstock for the Capital fans,” Kelner said of the scene. The energy in and around Capital One Arena was palpable. 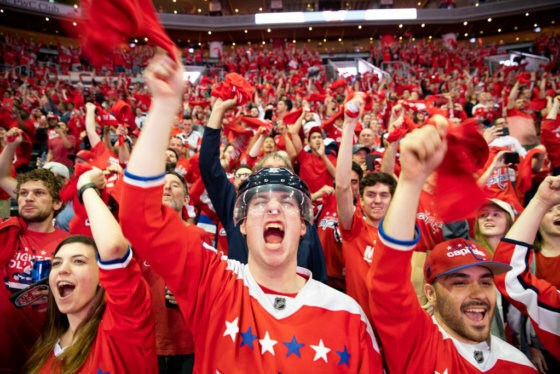 Energized, speechless, tipsy, whatever iteration of excited comes to mind would suffice in describing the Capitals fans inside and outside their home arena. Wes Johnson, the Capitals’ PA announcer, got the official party started after the early crowd took in the Washington Mystics — Minnesota Lynx game before the watch party. Red rally towels waved, the cheers grew. At 8:22 p.m. the puck dropped. The day of reckoning for the Washington Capitals had arrived. The first period came and went. Alex Ovechkin rang one off the post on the lone power play of the period. Vegas had their fair of chances too — the most promising of which was a puck smoked off Braden Holtby’s mask while short-handed. The array of chances were met with a chorus of “Oohs” and “Ahs” depending on the team. Score aside, Capitals fans remained enthused. Kevin Porter, a D.C. native who named his firstborn son Alex after the Capitals’ captain, joined by his father Dan, waved his rally towel, beer in hand, for almost the entirety of the first period intermission. He hadn’t batted an eye since the puck drop. He remained confident. “You’ve got to believe,” Porter said. Jakub Vrana sent the Capital One Arena crowd and the folks crammed together in the streets into pandemonium with his backhand goal that broke the scoreless tie. Screams of “We want the Cup” commenced. Nate Schmidt tempered the crowd for a moment; 34 seconds to be exact. His goal off Matt Niskanen’s skate knotted the game at one. The back-and-forth was on. Capitals fans were again sent into insanity when Ovechkin struck on the power play less than a minute later. David Perron spoiled the party shortly thereafter, putting a puck past Holtby to tie the game. Chandler Stephenson’s near-miss off Marc-Andre Fleury’s skate late in the period brutally teased the Capitals faithful as the in-house goal horn blared. Perhaps it was a signal of things to come, though in a positive way for Washington fans. Reilly Smith’s late power play goal quieted the crowd again, not to complete silence, but uncertainty began creeping in. Vegas lead 3-2 heading to the third. Hockey looked like it would head back to Washington on Sunday. The third period began with a promo video. It’s the one that precedes Capitals’ home games. It shows flashes of the team’s stars: Ovechkin, Holtby, T.J. Oshie and Nicklas Backstrom are all featured. Images and videos of the players in their youth span the screen before shifting to present-day highlights and headshots. Dramatic horn music graces the background of the montage. It’s inspirational in nature — a tune that borders on bringing one to tears, yet also hyped up the crowd for the decisive final period. The Capitals re-entered the ice. Vegas had their share of opportunities early. Nervous cheers and shrieks scattered around the arena. The Capitals began to settle in and so did the fans. Lars Eller was taken down on a hooking call and the red army inside Capital One Arena sprang to life. Two minutes went by and Washington failed to capitalize on its chance. Looks of grief graced the faces of downtrodden fans around the stadium. Music roared during the commercial break but few in the crowd partook in the show — this is no time for games, a Stanley Cup is on the line. Tick, tick, tick, BANG. They’re back. Devante Smith-Pelly, the gift that keeps on giving this postseason, had tied the game. BANG, BANG. Lars Eller does it this time. The Capitals lead 4-3 and madness ensues. The earlier cheers of “We want the Cup” are back. Rally towels fly around. Hugging and cheering can be seen in all corners of Capital One Arena. The only way to describe it — it’s happening. 3. 2. 1. Wait. A whistle stops the clock with 0.6 seconds remaining, but you get the picture. After 43 long seasons the Washington Capitals are Stanley Cup champions. The red-clad hooligans flood the streets. The scene was nothing short of absurd. The clank and crunching of glass and empty beer cans filled the moments between screams and tears. Fans invaded the 7th St. steps, where just weeks before Penguins fans taunted and jeered them after another Pittsburgh win in D.C. Others trying to get a good view, much to the chagrin of D.C.’s finest, scaled any kind of tree, telephone pole, or building they could. A group of younger supporters found themselves on the metal awning next to the Clyde’s sign beside Capital One Arena. High above the craziness of street-level, they yelled and screamed as if liberated — and of course their actions were justified, their favorite hockey team had just won their first Stanley Cup title. Peter Vogel, a lifelong Capitals fan from Falls Church, summed up the feeling on the street in about as blunt yet eloquent a way possible. They came in droves and left like an avalanche. Old and young. Black and White. Men and women. For a city often known for its divisiveness and political landscape, Thursday night proved there are some things in this world everyone can rally around. In Washington, D.C. around 11 p.m. that thing was the Washington Capitals. Ben Portnoy is a summer intern for The Sports Capitol. A rising-senior at Indiana University, he has covered the IU football program extensively as a beat writer for the Journal Gazette in Ft. Wayne, IN. His work has also appeared with The Naples Daily News, The First Week in April and Más+Menos — a Spanish-language magazine in Seville, Spain. Ben co-hosts “The Takeoff” on 99.1 WIUX and does on-air commentary for Big Ten Network-Student U.